After the delays due to the World Cup, I was very happy to see “Incredibles 2” released at last. 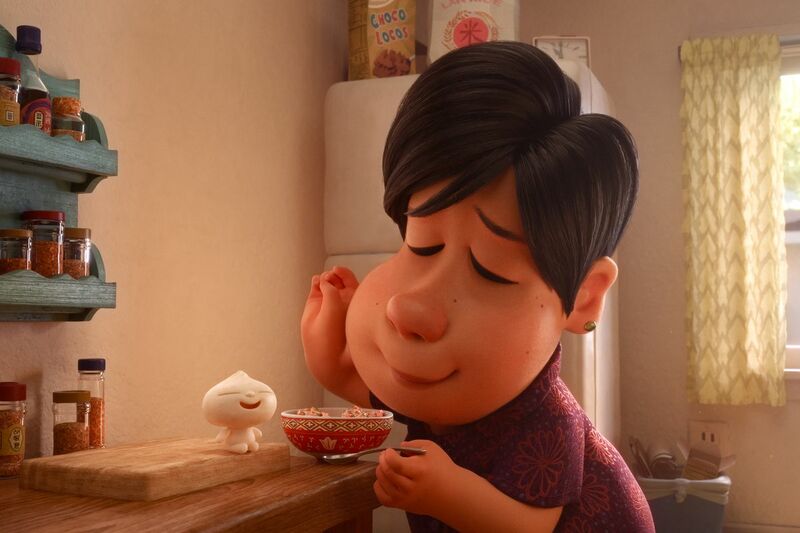 The major reason for my anticipation for seeing this film in the cinema, is the short preceding the main feature, “Bao”, the first Pixar production with a female director, and one of Chinese heritage, no less. Needless to say, my expectations were high, and this adorable work has met them. 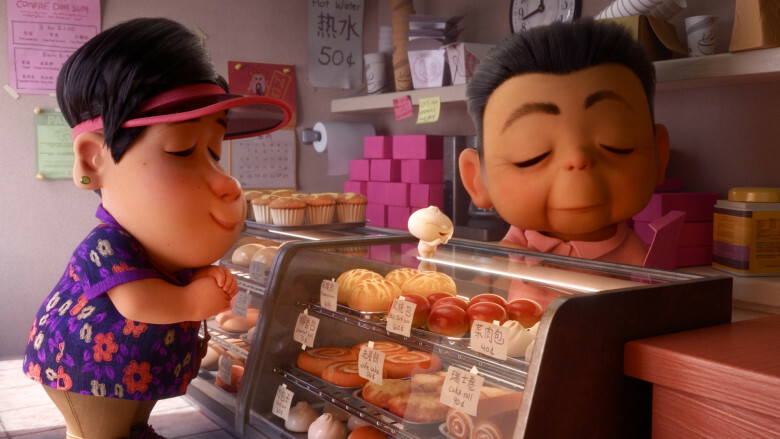 The film is named after a common Chinese dish, the Bao Zi, which is Chinese for bun. As Canadian Chinese director Domee Shi intended it to pay homage to her heritage, here’s a little cultural background about Bao Zi. Usually about the size of a child’s fist, they come with filling, more often savoury than sweet. There are hundreds of different types of Bao Zi unique to different regions across the whole of China. They are an important part of everyday cuisine, whether taken as part of dim sums, with pickles and other dishes as part of a main meal (a custom in northern regions), eaten as a traditional breakfast, or bought as a snack hot off the giant steamers from the local street vendor. Traditional Chinese animation, such as ink wash techniques, facilitates the rendition of soft contours and irregular shapes, something that is more challenging for Western animation and computer effects, as Shi has pointed out. From the finished work though, it’s evident that the teams at Pixar have met this challenge with ingenuity and accuracy, making a lump of dough, not only look like a real fluffy bun, but quite literally come alive. “Bao” tells its story through one of the major facets of Chinese culture – food, demonstrating at different stages of its narrative, how pervasive food culture is to every aspect of Chinese life. The film begins with the making of Bao Zi. Mom’s wondrous dream or experience starts with the steamed breakfast that she makes. The development of her relationship with the bun creature is presented in tableaus of the pair food shopping in bakeries and markets of Toronto’s Chinatown, and sharing pancakes on the bus. The final happy reunion takes place with the whole family making Bao Zi at the table, offsetting in the image of Mom making it alone at the beginning of the film. The Western fiancée gets properly accepted into the family by partaking (and excelling) in the experience of making Chinese food. In Chinese culture, food is a bonding experience throughout the fabric of society, and the traditional way in which parents express their love for their children. Like sentiments in the film, the interiors of the family home, is Chinese down to a tee, from the dragon statue on the cupboard, to lucky charms on the wall and the ample range of herbs and spices in the kitchen. Yet the film manages to be very relatable for all audiences, using food experiences common to us all to convey feelings and emotions in a work without any dialogue. The brief scene at the breakfast table says tons about Mom’s life and state of mind. Even though he is made of dough rather than flesh, the bun creature goes through the same phases of adolescence as any teenager, wandering off from Mom to join the other kids in the park, slamming his bedroom door in her face, pushing her away to hang out late with his friends, experiences that every parent can relate to. In Chinese, “Bao” is homonymous with the term for treasure, “Bao Bei” being an affectionate term similar in meaning to “baby”, and “Bao Bao” a term of endearment used to address babies, toddlers and often as nicknames for young children in the family. 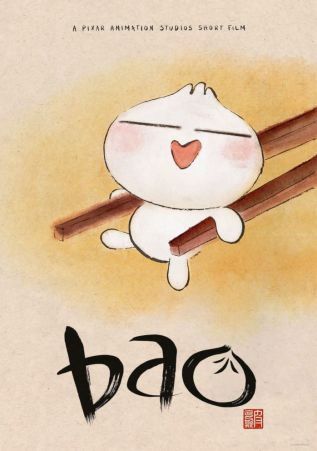 So as a title, “Bao” holds multiple meanings beyond a reference to the dish, symbolizing what is dear to one’s heart, the love of a mother for her son, the love between parent and child, the importance of community, family, paramount in Chinese as well as other cultures. With an infallible and age-old recipe of food and family, “Bao” has nevertheless presented a refreshing narrative with a bold and imaginative metaphor. Pixar’s parent company Disney, has an odd relationship with China. As one of its major consumer markets around the world, the country’s representation in the company’s output has been flawed to say the least, with most audiences only having one film “Mulan” (1984) as their reference to China, and the recent controversy surrounding the new live action adaption. After seeing the amazing “Coco”, I once again remarked how wonderful it would be for the Western audience to be acquainted with the customs of Chinese Ghost Month through an animation like “Coco”, featuring vibrant welcome-homes to the ghosts of dead loved ones. With the release of “Bao”, I dare say my wishes are beginning to come true. I hope that Pixar, as part of Disney, continues to draw from diverse cultures, and will one day produce feature length animations related to China, from its wealth of available material.